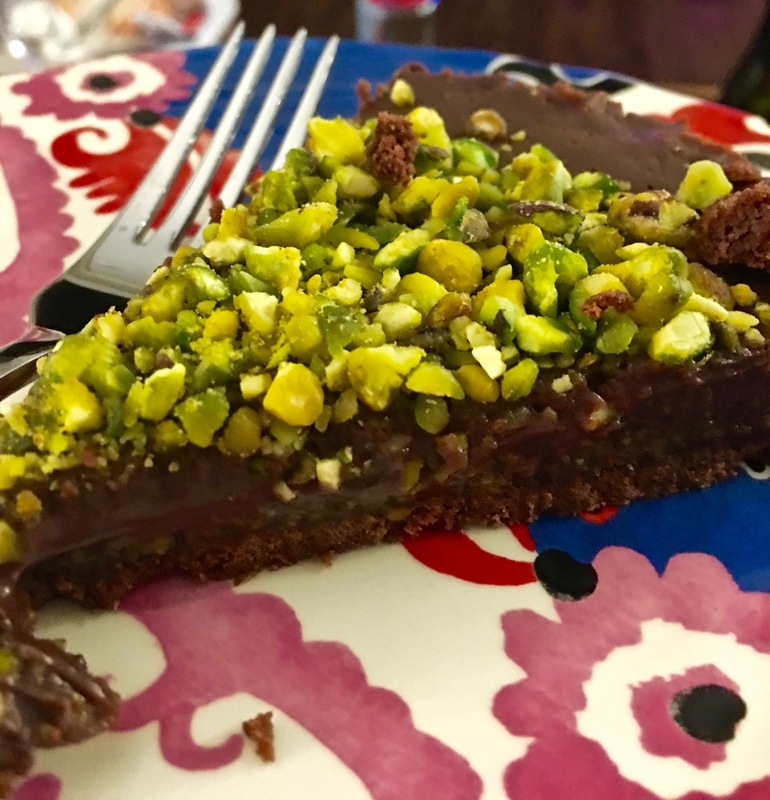 Chocolate Pistachio Tart and Our One Year Anniversary – One Half Indian. We finally made it to one year…alive and well! Hooray! I made the dinner for the day of our anniversary, and my husband planned a food-tour of Asheville, NC for the weekend. Both celebrations exceeded all my expectations. (Warning: I am about to get mushy) I really do love my husband! I saw a rerun of Martha Stewart making this tart a few weeks ago, and knew I wanted to make it on a special occasion. It was light and not too sweet and the perfect ending to a lovely day together. In addition to the tart, I made homemade pasta stuffed with ricotta/mozzarella/parmesan and spinach. We also had caprese salads with buffalo mozzarella, tomatoes, and cantaloup. It was my kind of meal for sure- all European-mediterranean kinda stuff. We finished it all off with some prosecco. 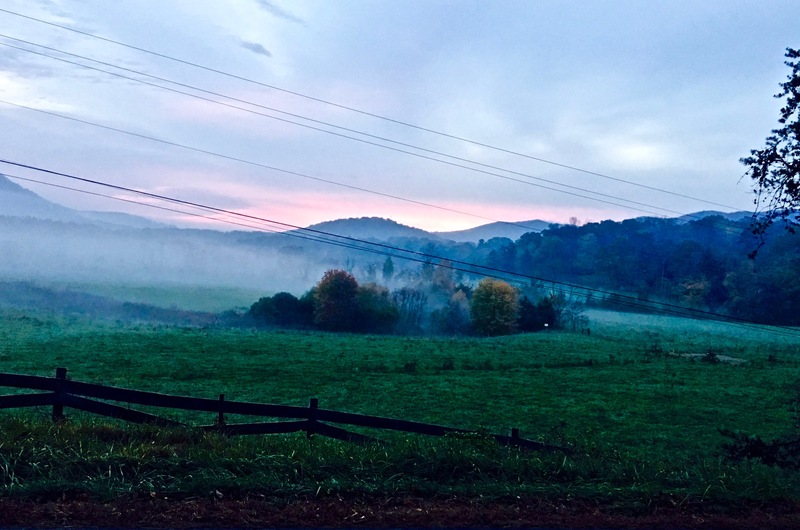 In Asheville, my husband chose the most charming and delicious restaurants. We went to Home Grown for dinner, King Daddy’s for breakfast, a forgettable Korean place for lunch, and Market Place on Wall Street for the big dinner. We also did some bar hopping on our first night after Home Grown. We ended the bar night at a place called Vault that was packed to the walls, but had delicious late-night snack options. We also did some shopping and mostly bought cookbooks and other kitchen related items from cute little shops around. All in all, it was a fabulous and memorable trip. 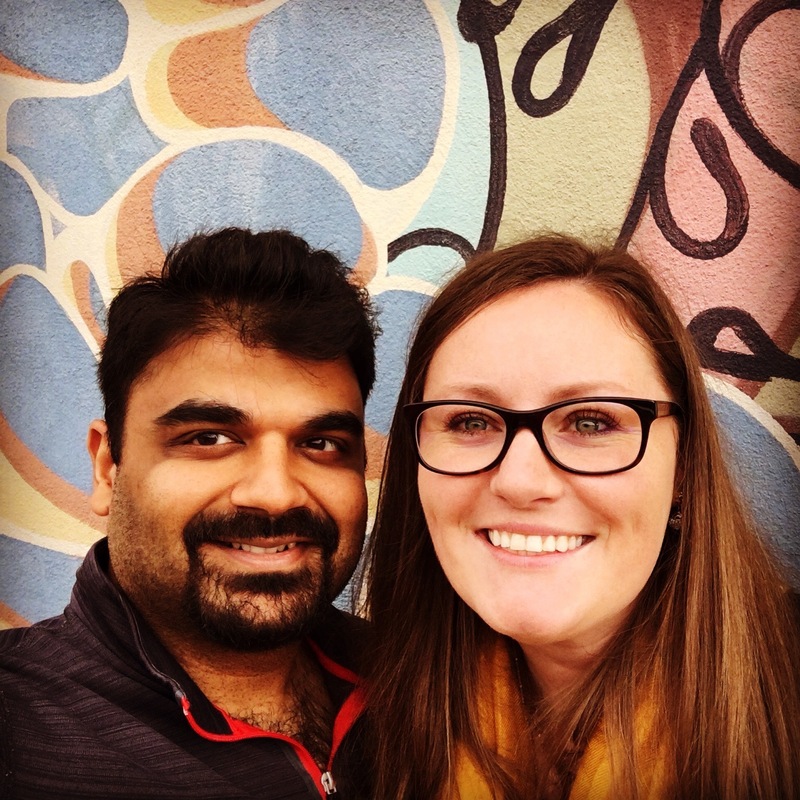 We both are eager to go back, but I know we have set the bar high with this first trip, and it is unlikely that I will think about another trip to Asheville as fondly as I think of this first anniversary trip. Original Recipe from Martha Stewart. I altered the amounts of ingredients and made some substitutions. We can’t all have Sicilian pistachios, Martha. Coat a 9 inch fluted tart pan with a removable bottom with oil. 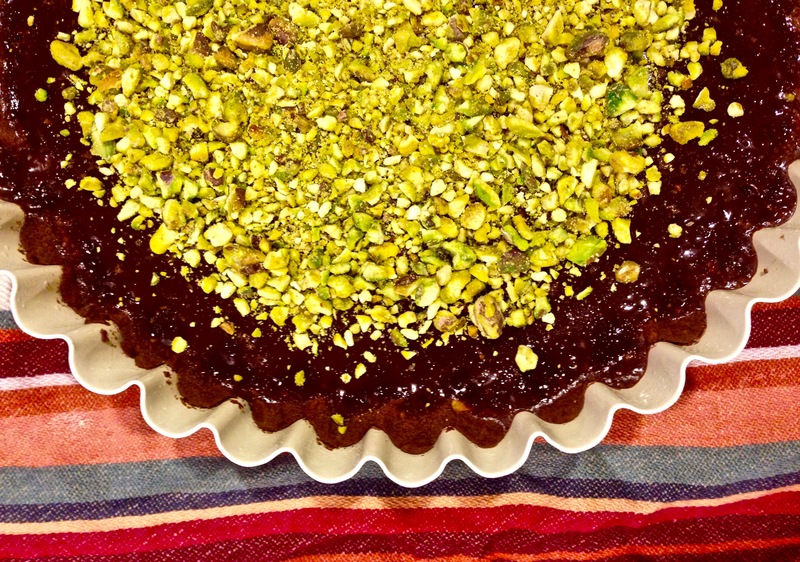 To make the crust, combine the flour, cocoa powder, chopped pistachios, and salt in a bowl. In a mixer, beat butter on medium speed until fluffy, about 3 minutes. Add sugar and beat until pale, about 2 minutes. Reduce speed to low and add the vanilla and the flour. Beat until just combined and dough forms a ball. I added an extra 2-3 tbsp of flour to help my dough come together a bit more. That may have been due to weather/climate. Who knows. Do it if you feel it is right. Lay plastic wrap out on the counter. Dump dough ball out of mixing bowl and onto the plastic wrap. Form dough into a disk and wrap with the plastic wrap. Refrigerate for 15-30 minutes. Martha says to roll the dough out, then carefully place the dough into the tart pan. That did not happen for me. I rolled my dough out a bit, and then just placed it rather brokenly into the tart pan. I then used my fingers to spread the dough out starting in the center and working to the edges. I tried to make it as even as possible, but it was definitely rustic. Trim excess dough from edges to make a straight edge. My pan had high edges, so my tart did not go to the top edge. I just did my best to make it straight. Refrigerate until firm, at least 1 hour or overnight. Meanwhile, preheat oven to 325 F. Bake until firm, about 30 minutes. Let cool completely. Reduce oven to 300 degrees. Make the pistachio paste by pulsing pistachios, sugar, and salt in a food processor until mixture begins to clump together. Add oil and honey and pulse until the mixture is paste like. Spread evenly on bottom of cool tart shell. Press firmly with your fingers or the bottom of a measuring cup trying to make the paste even across the bottom. Make the filling by placing the chocolate in a heatproof bowl. Heat the heavy cream and milk in a sauce pan over medium heat until just about boiling. Pour the heated milks over the chocolate and let stand for 2 minutes. Slowly whisk until smooth. Let mixture cool 10 minutes and then stir in egg until combined. Place tart on baking sheet and pour in filling. Bake until just set, about 30-35 minutes. Let cool completely. 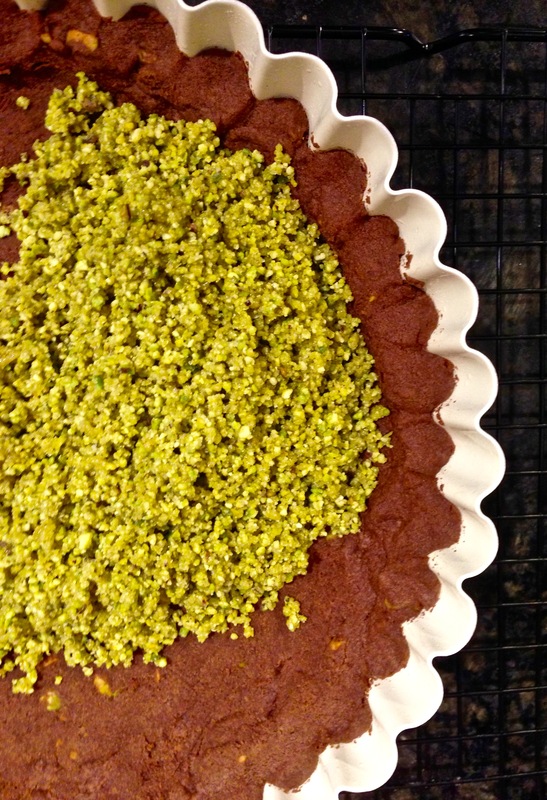 Garnish with finely chopped pistachios. Looks so good! you can never go wrong with pistachios! I always wondered how pistachio paste was made! Thanks for the recipe! Thank you. It was SO good! Thank you! Yes please come! I will make all the tarts you want!